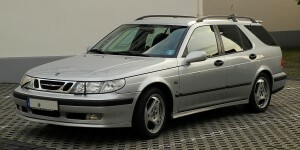 Saab released its first sedan in 1997, and since this release there have been massive changes in the engine and appearance of its vehicles. The new Saab 9-5, released in 2002, featured changes and additions to its image, having a sportier look and specific wheels for each model. Part of the revamp of these cars was the new model names, including Linear and Arc. The Linear was the entry point vehicle and came with a choice of a 2.0 and a 2.3 litre light-press turbocharged engines. They have an average of 19–28mpg and horsepower of 185 at 5,500 rpm. The Arc has a 2.3 litre light-press turbocharged engine. It is a 5-speed automatic, however a 5-speed manual could be ordered at the factory at no additional cost. The new wheels specifications on the arc are 16-inch five-spoke alloys. The Saab 9-5 2002 was a luxury vehicle, highlighted by its standard general equipment and safety features. Its general accessories are remote central locking, power steering, cruise control, heated mirrors and a sunroof, and its safety features include an antilock brake system (ABS), front and side airbags in the driver and passenger seats, electric brake force distribution and a side impact protection system. The overall driving dynamic of previous Saabs were tweaked, giving the vehicle a sportier feel. Suspension was improved, shocks were returned and springs were stiffened which can lead it to be a bit hard on the road. The vehicle drives safe and solid, if not a little predictably, and while there have been engine improvements the acceleration is still a bit off the mark. Although this is a popular car and often considered extremely reliable, it has suffered a few issues over the years. It seems to be a common occurrence for the head gaskets to blow, costing about £1,149 to repair. There have been reports of failing or flickering HID lamps. This is due to the head of the washer fluid developing a leak, leading the fluid to leak into the HID lamps causing them to short. In addition, some vehicles have died while driving due to the direct ignition cassette failing, and they tend to have an erratic and noisy idle that usual results in them stalling frequently. The new flex pipe on the vehicles is susceptible to failure, which causes the exhaust to sound ridiculously loud. If your beloved Saab 9-5 is causing you problems and is proving too costly to fix, then contact Scrap Car Kings today. We can collect and scrap your car quickly and easily, leaving you free to look for a suitable replacement.